Washington — Medical device makers, hospitals, and even the U.S. Food and Drug Administration and Centers for Disease Control and Prevention have spent the last several years scrambling for a solution to contain hospital-acquired infections — without much to show for it. Antibiotic-resistant bacteria are still causing patient deaths. Since 2012, there have been about a half-dozen outbreaks of HAIs affecting up to 150 patients in Illinois, Pennsylvania and Washington state. Last year, an HAI outbreak at UCLA’s Ronald Reagan Medical Center resulted in three deaths and 179 patients exposed the to superbug known as CRE. Such outbreaks raise questions about whether hospitals, medical device manufactures and regulators are doing enough to protect patient safety. Some consumer groups are even calling for more in-depth disclosure for patients, delving into the increased risks for infection before undergoing certain procedures or using reprocessed devices. But what can the plastics side of the medical device supply chain do to minimize the potential of spreading potentially life-threatening bacteria via otherwise potentially life-saving medical devices and procedures? Eastman Chemical Co. is moving its materials messaging through the supply chain, all the way to the disinfectant makers and end users. Guidance on disinfecting plastic surfaces has a long way to travel through the supply chain, said Ellen Turner, market development manager for specialty plastics and medical devices at Eastman. And with materials suppliers so far upstream, it can become like a game of telephone, she said. “We hear that more and more disinfectants are coming out all the time. Some of those disinfectants, the hospitals are learning, are really breaking down the plastics. They are desperately doing their own testing, trying to figure out what doesn’t break down the plastic. But they’re not materials scientists,” Tuner said. “So what we did is our own study with the disinfectants and developed a protocol we could pass all the way down, a study to figure out how well our Eastman MXF-212 material holds up. It’s a Tritan copolyester with a flame retardant in it. It’s BPA free, halogen free, no chemicals of concern.” But more importantly, she said, from lab tests to discovery sessions with local hospitals, it surpasses the performance polycarbonate/ABS when exposed to harsh disinfectants. Eastman’s holistic approach to customer support is particularly important with medical customers fighting HAIs, she said. Looping the medical device supply chain back over on itself, talking with disinfectant makers and clinicians — the end-users themselves — about material selection and what happens after. “What we really like to do is get involved with the engineer who’s making this materials choice and help them think more out of the box about the whole thing,” Turner said. As HAI and other sterilization concerns have become an increasingly hot topic for the plastics side of the medical device industry, Gilbert Galon, development manager for health care at Solvay Specialty Polymers in Alpharetta, Ga., said he finds that providing technical support to customers isn’t as much about processing or standing next to a molding machine any more. As the medical device supply chain has compressed, it’s important for materials-side industry folks to remember that even though they’re not the device designer, “the designers need to hear everything you have to say,” Galon said. It’s the materials scientists that best understand about choosing the right material when it comes for the common “designing for misuse” considerations that go into the creation and federal approval of every medical device. Device design, materials selection and communication through the supply chain, however, are only a part of the solution to the HAI problem. More outbreaks and deaths would be occurring across the country if the doudendosopes were fatally flawed at the design level. More than 500,000 procedures using the instruments are done every year in the United States, according to FDA. A January report to Congress, spearheaded by Sen. Patty Murray (D-Wash.), spreads the HAI blame far and wide, calling out medical device manufacturers for not owning up to problems soon enough and even warning European customers before U.S. outbreaks began, the FDA for lax guidelines and oversight and failing to alert the public to problems sooner, and hospitals for keeping FDA, device makers and sometimes even the patients themselves in the dark about device-transmitted infections. Murray has since proposed a bill (S 2503) that would step up the regulation of the already heavily regulated medical device industry, requiring manufactures of reusable medical devices to submit cleaning and sterilization instructions and efficacy data as part of the 510(k) FDA approval process. Meanwhile, regulators are trying to step up requirements already in place, updating standards for the machines used to reprocess the scopes between uses. FDA also issued a recall in November for the 2,800 automated endoscope reprocessors (AERs) from Ivyland, Pa.-based Custom Ultrasonics Inc. that were still being used in the United States. 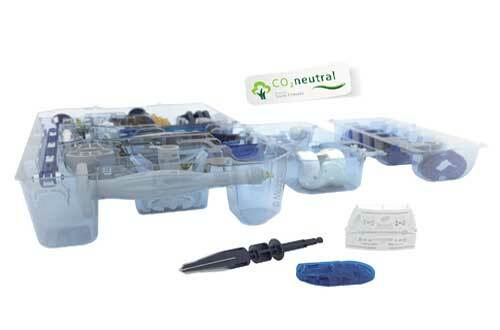 The medical device industry is also taking heed and moving toward ever smaller and more complex disposable devices. Plastic pill-sized, swallow-able, disposable cameras were on display in Anaheim at the Medical Design & Manufacturing West show with Covestro. While not a maneuverable as the flexible tube with a camera on the end, a disposable carries far less risk for all involved. While clinicians are willing to pay a higher price for a higher performing device, the more electronics or complicated parts mean fewer sterilization options. For a high kill-rate, the preferred sterilization method for many surgical tools is steam. But electronics, including those in the problematic duodenoscopes, instruments have to be sterilized at lower temperatures over longer periods of time with very corrosive gasses such as hydrogen peroxide, and usually more than one cycle is recommended for safety’s sake. Even when FDA provides safe sterilization guidance and a materials supplier provides protocols and instruction, the risk still exists. “We have found that some of these high-performance materials are compromised because [hospital employees] don’t follow the instructions,” Solvay’s Galon said. Though there is some perception that single-use medical instruments have a negative environmental impact vs. reusable instruments, a recent study by Solvay in conjunction with orthopedics and instrument maker Medacta International and Swiss Climate, proved those concerns to be unfounded. The study compared the environmental impact of Medacta knee replacement kits — one with all metal, reusable instruments — and the other with single-use, injection molded instruments using Solvay’s high-performance medical grade polymers. In addition to saving up to 115 gallons of water on each knee replacement procedure by avoiding repeated washing and sterilization, the study found the plastic single-use kits to be carbon neutral when compared to the reusable metal kits over their entire cradle-to-grave life cycle, including raw materials, production, use and disposal, as well as post-use management, reuse and recovery.